What happens when North American retirement ideals of adventure and personal growth collide with the material realities of a Latin American city, going through a process of rapid urban growth spurred by rural-to-urban migration? This is a question I tried to answer in Gringolandia: Lifestyle Migration under Late Capitalism. North American retirees are not only developing new ways of aging and experiencing retirement, they are doing so in conditions of economic uncertainty and financial precarity unlike those of recent generations. The financial crisis of 2008 left many without the savings for the retirement they hoped for. But thanks to a sharply unequal global economy, thousands of self-proclaimed ‘economic refugees’ have managed to rescue the retirement they dreamed of by offshoring it to Cuenca, Ecuador. Cuenca is a city of about 400,000 people located at 2,500m in the Andean Sierra, designated a World Heritage Site by UNESCO in 1999. Since the 2008 crisis, perhaps as many as 10,000 US Americans and Canadians have relocated there, drawn by rosy-tinted depictions of its colonial-style charms in online marketing. American-run companies speculating in transnational real estate have been using internet algorithms to promote offshore retirement destinations to later-life workers unable to afford a middle-class North American retirement. Not all those who retire to Cuenca are poor—though certainly a few would fall below the low-income cut-off in the US or Canada. They simply could not afford to age in place without a working income, especially in desirable but rapidly gentrifying urban spaces in cities like Houston, San Francisco, Portland and Toronto. In Cuenca, they can live easily in a city where the average income is about $700 per month, but where many live on much less. North American migrants’ higher incomes are a major source of economic demand in a city now undergoing a makeover. The Ecuadorian government is promoting a One for One tourism campaign, designed to draw one tourist for each resident in a bid to make the sector the most important source of foreign revenue outside the oil sector. In 2018, tourism receipts are expected to rise to almost $1.8 billion US. Many of these tourism arrivals are lifestyle migrants settling permanently in a country whose constitution recognizes universal citizenship rights for resident foreigners. Many others visit on tours operated by international lifestyle marketers, trying on different destinations to see if they feel they can live in a Latin American setting. Since the 2000s, foreign development agencies, the Inter-American Development Bank, and UNESCO have sought to promote Cuenca’s “Heritage Urban Landscape” and have facilitated access to loans for urban upgrading, in particular through the IADB’s “Emerging Sustainable Cities Program.” Their interventions position the city within the tourist gaze and appeal to North American settlers, and aim to increase land values and ground rents. While there are jobs for some, lower-income uses of El Centro are marginalized, and low-skilled workers and informal vendors are increasingly removed or prevented from accessing El Centro. In the leisure space that is being built in El Centro, later-life North American migrants take advantage of opportunities to get outside their comfort zone and experience a new culture, broadening horizons that many say they felt collapsing around them as they aged into poverty at home. They participate in new activities in their new home, where they can afford to go out frequently and have social lives that remind them sometimes of their college days. Their higher incomes enable them to occupy positions as patrons and benefactors of neighbours and young people that they could not afford at home. They set up charities aimed at deserving poor—especially women and orphans—and position themselves as helpers in ways shape their experience of aging successfully in Ecuador. The colonial-style built environment that houses their new lifestyle experiments reflects unequal and unjust colonial social relations. Cuenca was built by a landowning elite, whose wealth came from the exploitation of a landless and often racialized peasantry—a significant part of which worked in conditions of indenture until the late 1960s. Cuenca, the seat of urban, European power, presided for centuries over a mestizo and indigenous countryside of small tenant farmers and indentured servants, who would come into the city to sell small agricultural or manufacturing surpluses to commercial and landowning elites. These latter recouped their money by selling manufactured items to their rural workers. El Centro was abandoned in the 1950s and 1960s, as wealthier Cuencanos relocated to American-style suburbs. Its population dropped, but was sustained by an influx of rural-to-urban migrants from a countryside going through a rapid process of social transformation in the late 1960s and early 1970s. As Ecuador initiated a series of land reforms designed to redistribute land to indentured labourers, elites in the region around Cuenca sought to avoid redistribution by forcing previously indentured workers to accept title of small properties while retaining the most productive agricultural lands for themselves. The preservation of El Centro now reproduces the injustices of the past. El Centro’s UNESCO “Heritage Urban Landscape” enshrines the tastes and property of European-oriented landowning elites, but marginalizes popular and rural traditions, particularly the informal vending practices and uses of public space in El Centro. Restoration projects prioritize the tourism uses of public space, and rising rents push lower-income households toward self-built suburbs on the city’s edges. A new tram project is set to open later this year or early next, but its cost will be recouped in part through fare increases, and the lack of bus transportation across El Centro from East to West leave many Cuencanos wondering if the hundreds of millions of dollars were well spent. The successes of Cuenca as a lifestyle migrant destination are not shared equally. The Ecuadorians who benefit most from the building boom that has accompanied the North American migration are the landowning elites, self-described as ‘nobles’ and Spanish-descendant. One wealthy family that has diversified into construction owns large tracts of the neighbourhood now called Gringolandia—the North American ethnic-ghetto which serves as a gateway for many prospective lifestyle migrants to the rest of the city and region. Some middle-class Cuencanos with experience studying or working in the United States benefit from new business opportunities and a wider range of restaurants. But a third of the Cuencano workforce is dependent on informal labour, such as street vending. While some no doubt benefit, urban interventions create higher-income spaces and marginalize lower-income people. While informal vendors and lower-income workers struggle to remain in place, the city around them is changing under forces that are not within their control, and that draw in financial interests quite far removed from the Andean Sierra. The ease with which North Americans can relocate their lives to Cuenca and displace lower-income workers smacks of a sort of colonialism most lifestyle migrants eschew and seek to mitigate, escape, or resist. Despite attempts to make amends for their whiteness (almost all are white) and their privilege, they identify with all the advantages of having higher incomes and higher status in a lower-cost and lower-income community. Their experiences as migrants differ completely from those of lower-income workers trying to find work in the United States or Canada. As these latter are met with an increasingly restrictive and militarized border regime, lifestyle migrants fill out paper work, and are welcomed with full citizenship rights denied to Latin American migrants moving north. Among the benefits they enjoy are access to Ecuador’s public medical system for operations and check-ups, a service Ecuadorians spend a lifetime paying into, but that foreign residents access for only a small fee (about $70 per month at time of writing). Cuenca and similar heritage cities in Latin America offer a picture of the world we are entering, one where inherited inequalities are multiplied in perverse forms, and the benefits of transnational mobility and facility of telecommunications are shared unequally and unjustly. For some, Cuenca has become a safe haven from precarity. For others, it is a home that is being taken away and transformed. Matthew Hayes is author of Gringolandia: Lifestyle Migration under Late Capitalism. Hayes is the Canada Research Chair in Global and International Studies at St. Thomas University in Fredericton, New Brunswick. "Matthew Hayes provides a vivid sociological portrayal of North Americans living in Ecuador alongside a theoretically sophisticated analysis of the global inequalities that shape growing north-south migration. Gringolandia is a must-read for students and scholars interested in a complex understanding of transnational migration in the context of 21st century globalization." 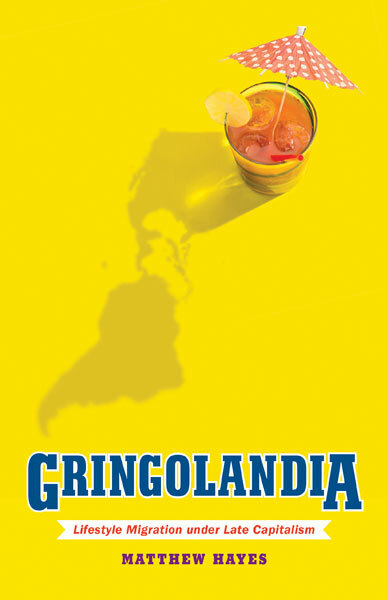 "Gringolandia offers a refreshing and powerful new perspective on lifestyle migration that demonstrates how it is caught up in the production of global inequalities informed by colonial legacies, the structures and practice of planetary gentrification, and the local class struggles this portends. 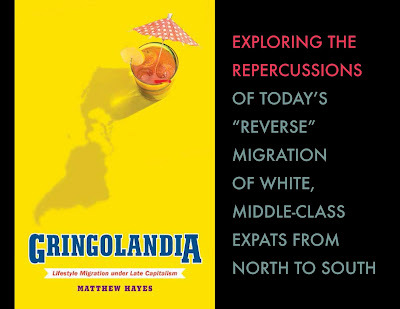 Through his up-close ethnographic observations of the lives and motivations of North Americans living in Ecuador, Matthew Hayes presents a timely and sorely needed intervention that straddles the sociology of migration and urban studies, woven together through a deep concern with decoloniality."